What is the one thing that keeps you up at night? What is the one thing that makes you afraid to take the next step, to make the call, to strike out and try something new? Uncertainty can either exhilarate or paralyze you. For most of us, feelings of uncertainty fall somewhere between the two and if they lean more toward the paralyzed side of the scale, can eat away at our self-confidence and keep us from doing what we are meant to do. The speed of our world continues to accelerate which only serves to ratchet up feelings of uncertainty. And with this comes some pretty ugly consequences. Fear, overwhelm, looking outside ourselves for answers instead of trusting our hearts and minds, and overprotecting ourselves keep us small and unwilling to take calculated risks. In other words, uncertainty keeps us in a constant state of anticipation, much like riding a roller coaster. But what if there were ways to embrace uncertainty and work with it and not against it? What if you learned how to live with uncertainty and keep your self-confidence intact? 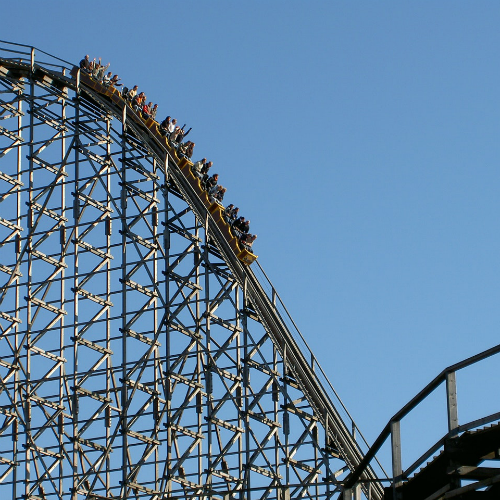 That’s sound like a much more exciting roller coaster ride to be on and here are five ways to make that happen. Worry, fear, and stress come from the unknown so the first step in dealing with uncertainty is to get crystal clear on what cannot be taken away from you. These are the intangibles that live in your heart and function as an anchor in the storm. Are you a person of integrity? Do you do what you say you will? Are you a person of honesty who values and models trust in your relationships? What are the three to five values you live by? What do you stand for? Your value as a human being is not determined by your profession, personal wealth, or social status. Find certainty in knowing that your value is simply in being yourself as a human being. Getting clear on what can’t be taken away can eliminate a great deal of uncertainty and is a great place to build a foundation for strong self-worth and esteem. I’ve written about this before here, but it cannot be said enough; time and energy are your most valuable resources. Deciding (and I mean offer no excuses, make the call, take a stand, and DECIDE) to choose what you spend your time and energy on acts as a blowtorch on uncertainty. Managing distractions gives you back precious time and energy that may be needed when things don’t go as planned. The beauty of this is that you have just as many hours in a day as everyone else and by cutting out useless energy and time drains, you get to rediscover and use those hours in ways that help you thrive, not wither. Where are you falling down meaningless rabbit holes? How can you better balance entertainment with periods of non-screen time rest? What are your top five energy and time drains and how can you take action right now to start reducing those drains? Cutting out distraction cuts down on uncertainty by giving you back time and energy that can be better used elsewhere. It’s that simple. To better manage uncertainty, you must be willing to process your experiences. Does that sound touchy-feely? Good, it’s supposed to. This doesn’t mean you have to hide in a cave for three days in total silence each time something happens but it does mean that you should risk the strange looks you may get by taking time away to figure out how you’re being impacted by what’s going on in your life. Reflection, taking time off, stepping back – all of these are frowned upon in our fast-paced society. But without them, you run the risk of staying overwhelmed and continuing to be plagued by what “might” happen, or “could” happen, without really understanding what would make you feel more confident and prepared for the unknown. This step builds on the prior two: get clear on what can’t be taken away, use your time and energy as best you can, and then take a moment to reflect on where you are. If you find yourself super wound around the axel over uncertainty, take a moment to remember that uncertainty has a silver lining. And that lining is that most things aren’t forever. Now clearly, there are things that result and permanent and irreversible change, but ask yourself if the situation you’re stressed about really falls into that category. If you lose your job, will you be 100% unable to get another job (even if it’s not ideal)? If you try something and it turns out to be a Spectacular Learning Experience (because that’s the preferred term I use instead of failure because failures are indeed Spectacular Learning Experiences), will all the consequences of that SLE last forever? Probably not. Anxiety over uncertainty can be tamed by grabbing a new perspective and remembering that most things aren’t forever and in all actuality, uncertainty may be your friend by giving you a different and even better outcome than you expected. If things don’t last forever, be open to outcomes you may never have considered. They may make you happiest of all. The key to rocking uncertainty is to remember that you have the power of choice in every situation. Take time right now and add this to the list of things that cannot be taken away from you and can serve as part of your anchor. Having the power of choice helps you feel more confident with uncertainty. It helps you choose what distractions to keep and ditch. It helps you say yes to time away to reflect on life. The power of choice helps you recognize the beauty of silver linings and allows you to react from a place of understanding that things don’t always last forever. What you allow into your heart, mind, and spirit is a direct result of your choices. What you believe about uncertainty also comes from a powerful place of choice. Uncertainty is a growing part of our world and how you react to it will shape your future. These five ways of embracing uncertainty can help you have more fun on the roller coaster all while keeping your self-confidence strong and intact. You cannot escape the future, but you can face it with a different outlook. Go forth and conquer!